The city of Winnipeg is developing a new residential infill strategy that is slated to be completed and approved by the spring of 2018. A number of public engagement sessions have been held since June, including a special session with WinnipegREALTORS® in September. A number of good suggestions came out of all the sessions. A project web page has been set up at http://winnipeg.ca/infillstrategy, which summarizes feedback from the public engagement sessions already held, explains the ins and outs of residential infill through FAQs, provides maps, shows areas of stability, and contains concise background information. Areas of stability are established neighbourhoods, which include mature neighbourhoods built prior to the 1950s and those started after the 1950s. Any new infill development in these areas is intended to be complimentary to the existing character and scale of the neighbourhood. “Based on the latest population forecasts prepared by the Conference Board of Canada, the city of Winnipeg is expected to grow by more than 200,000 people by 2040. While the greatest percentage of residential growth continues to occur in emerging neighbourhoods at the edge of the city, many new residential units built over the last five years have been located within established neighbourhoods. Market demand for new units in many existing neighbourhoods continues to remain high for the foreseeable future. “Infill housing is desirable because it makes efficient use of existing services. Established neighbourhoods already have infrastructure in place, are typically well-served by transit, and are conducive to cycling and walking, meaning less congestion and less wear and tear on our arterial roadways. This is why infill is an important tool in addressing our infrastructure deficit. There is also a residential infill strategy workplan at the website for perusal and printing. One of the interesting challenges for Winnipeg, which other cities are addressing head on, is what they call the middle range of housing. These properties are beyond the standard single-family home. At a meeting with WinnipegREALTORS® in March 2017, former city of Winnipeg city planner Michelle Richard, who is now a consultant with Richard Wintrup & Associates, stressed how important the infill strategy will be in encouraging and facilitating middle housing. Examples she used in her presentation were duplexes, triplex and fourplexes, townhouses, courtyard apartments, bungalow court and a multiplex. Another aspect of developing a residential infill strategy is neighbourhood reinvestment. Infill housing is one way to renew an older neighbourhood where housing stock is aging and deteriorating. 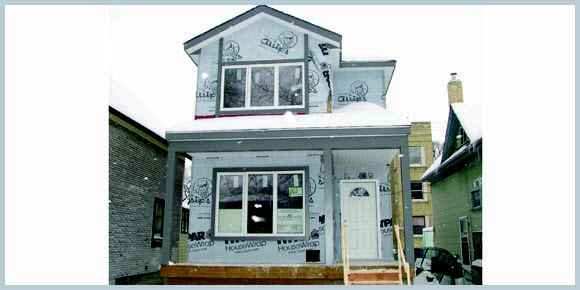 A good example in Winnipeg is the renewal work undertaken by the Housing Opportunity Partnership (HOP) in the West End. HOP, which was established by WinnipegREALTORS® in 1997, has either completely refurbished existing homes or introduced new infill homes with the aim of helping first-time buyers attain homeownership, which contributes to neighbourhood renewal. HOP has implemented a highly-successful strategy through specifically targeting streets and blocks in the West End. Many dilapidated homes have been removed altogether to make way for infill homes. The renewal effort has resulted in the value of homes increasing fivefold since HOP began its acquisitions in 1998. As described in the Complete Communities Direction Strategy as part of OurWinnipeg, infill will continue to be accommodated in all areas of Winnipeg. Increasing infill development along main corridors throughout the city is another opportunity that has already shown signs of progress over the last few years. The city’s infill strategy will strengthen the current policy direction and help address built form, design features, lot width and size, yards, landscape standards, density and zoning. WinnipegREALTORS® is not only participating in the residential infill engagement process this fall, but will be making a submission and provide recommendations to the city in the New Year. It has a genuine interest in ensuring that the city grows in a responsible manner without detracting from existing well-established neighbourhoods. The city has a very active public engagement process in place and will continue to reach out to groups such as WinnipegREALTORS® that are keen to have a say in how we shape our city’s future development.